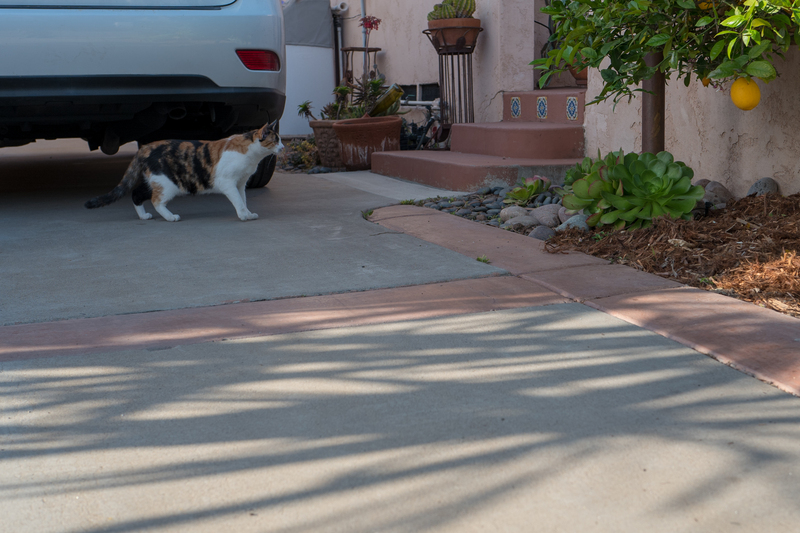 Along Golden Gate between Cleveland and Maryland Avenues, on April 8, 2018, my wife and I met two kitties that appeared to be companions. I nicknamed the other Bushy. 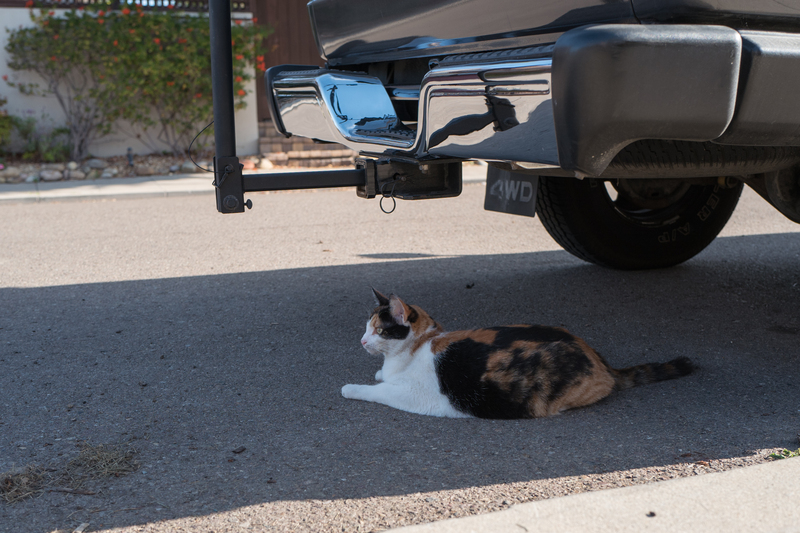 A neighbor says, and I can’t confirm, this lovely calico is Cali. The shorthair was friendly enough with the neighbor—and her dog Shelly—but kept distance from me. I used Leica Q to capture the Featured Image and its companion, 8:29 and 8:37 a.m. PDT, respectively. Vitals for the first, aperture manually set: f/4, ISO 100, 1/500 sec, 28mm. The second is same, except for shutter speed: 1/400 sec. May you have a lucky Friday the 13th! Catwalk down memory lane: Scruffy, Roly Poly, Woo, Skull, Biscuit, The Colonel, White, Chipper, Frisky, Stretch, Needy, Farfisa, Mates, Hunter, Pee-Pee, Blue, Blue Too, Bonded Pair, Patience, Fess, Jumper, Frenemy, Looker, Cozy, Scout, Lurks, Skit, Mini, Betty, Black and White, Stalker, Bell, Chill, Sammy, Scratch, Poser, Star, Grey and White, Watcher, Herman, Comet, Roman, Willow, Chub, Nimbus, Watson, Lilo, Kit, Pepe, Twilight, Sebastian, Spot, Booger, Ash, Veruca, Riley, Mellow, Bonde, Flower, Glass, Black, BeBe, Fang, Bruce, Siamese, Pounce, Tortie, Haiku, Fraidy, Peso, Daniel Tiger, Dusk, Stride, Dainty, Spry,Tabby, Betty Too, Still, Levi, Shadow, Sophie, Wink, Ferals, Momma, Charlie, Tux, Cool, Benny, Jellicle, Itchy Valentino, Goldie, Nine, Amanda, Siesta, ChaCho, Charlie, Too, Mika, Crystal, Seeker, Mittens, Dancer, Smokey, Monkey, Captain Blackbeard, Season, Maven, Tink, Chunk, Curious, Hanoi, Bella, Tarry, Guido, Maxine, Mr. Kitty, Peohe, Panda, Frankie, Sunshine, Twain, Willow, Too, Brawn, Reddy, Burglar, Laramie, Lupe, Bright, Tom, Charm, Buddies, Boss, Ohana, Seer, Fresh, Token, Lola, Carl, Bramble, Finny, Cal, Tipsy, Zander, Mew, Penny, Charlie (the Third), Bob, Apple, Persepolis, Sebastian, Too, Holiday, Snow, Desire, Luci, Torbie, E.T., and Bushy.